13th, the Second Sunday of APRIL, 2008. Well ! Today the 2nd Sunday of the April Month has become very auspicious to all of us, it is more of a festival where we gather and celebrate. There are many cults in our country which celebrate festivals on religious, regional &even memorial grounds. So why not celebrate for some thing which is very much our bread and butter. Last year we met at the Marvelous Mahabaliburam Seas and now today we are meeting at the Rustic Rajasthani Village Resort, I am really overwhelmed by your continued love and affection. 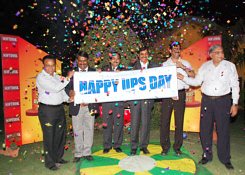 How I hope, this trend continues for ever and we actually start greeting each other with Happy UPS Day : UPS fraternity should make this day, there own. The enthusiasm shown by the UPS fraternity has made our will stronger to make the UPS DAY, a celebrative and a repetitive affair. In 2009, we will celebrate on 12th of April, preferably at Bangalore. Numeric’s HPE & HP Series of Online UPS Systems & HP Series of line interactive UPSs have been adjudged best in Product quality & After Sales Service in SD’s Users’ Satisfaction Survey 2007. Award being presented by Dr. S Sai Krishnan, Editor Softdisk to Mr. R Chellappan, CMD Numeric and his team. Synergy 3300, Harmony 3300 have been adjudged Best 3 Phase Online UPSs in Product quality for all ranges in SD’s Users’ Satisfaction Survey 2007. Award being presented by Mr. R Chellappan, CMD Numeric to Mr Pradeep Pimpley & Mr. H N Sayed of DB. Aplab’s Everest Series (Three Phase) and DSP PRO (Single Phase) have attained 92% satisfaction rating in SD’s Users’ Satisfaction survey, 2007. Award being presented by Mr. Sanjay Agarwal, President AUM to Mr Sandesh Pradhan of Aplab. Adjudged Best in terms of After Sales Service for Single phase online UPS Systems in SD’s Users’ Satisfaction Survey 2007. Ranked 2nd in terms of Product Quality & After Sales Service for line interactive UPS Systems. Award being presented by Mr. Pradeep Pimpley, Vice President DB, to Mr. R K Bansal of Uniline. BPE (I) PVT. LTD., NOIDA. SD’s No. 2 Offline UPS manufacturer of the Year. BPE-ABLEREX brand of Online UPS Systems (Single Phase) has earned a satisfaction level of 93% in the SD’s Users’ Satisfaction Survey 2007. Award being presented by Mr. K Ramachandran, CMD Neureol to Mr. Ranjit Singh of BPE. DELTA ENERGY SYSTEMS PVT. LTD., GURGAON. NT Series (3 Phase) UPS System has been voted best in Product quality & J Series (Single Phase) attained 94% satisfaction level with “A++” rating in SD’s Users’ Satisfaction Survey 2007. Award being presented by Mr. Arun Ghosh, MD HiTA, to Mr. K K Sharma of Delta. Rated “A++” in SD User Satisfaction survey 2007, overall ratings Chart. Award being presented by by Mr. Pradeep Pimpley, Vice President DB, to Mr. Abhijeet Guha of Hi-Rel. TRITRONICS (INDIA) PVT. LTD., NEW DELHI. Tini Tritron brand of Single Phase Online UPS has secured 91.5% satisfaction levels with A++ ratings in Users’ Satisfaction Survey, 2007. Award being presented by Mr. R Chellappan, CMD Numeric, to Mr. Rajan Chadha of Tritronics. Mega Power range of (3 Phase) & Com Power Series of (Single Phase) UPS Systems have “A++” satisfaction ratings and been voted best in cost advantage vis-vis cost effectiveness in SD Users’ Satisfaction Survey, 2007. Award being presented by by Mr. Sandesh Pradhan of Aplab, to Mr. I B Rao & Mr. M R Rajesh of Power One. SD’s No. 10 Power Electronic Company of the Year. Award being presented by Mr. R K Bansal MD Uniline, to Mr. Narayan Sabhahit & Mr. G V Sabhahit of Techser. SD’s No. 3 Line Interactive UPS Manufacturer of the Year. eMerge brand of line-interactive UPS Systems have been voted best in terms Product Quality in SD’s Users’ Satisfaction survey, 2007. Award being presented by Mr. Anil Munjal Vice President PCI to Mr. Amit Kumat Yadav of WeP Peripherals to Mr. I B Rao & Mr. M R Rajesh of Power One. APC MGE INDIA, , BANGALORE. APC’s Surt and Back UPS judged SD No. 1 in Users’ Satisfaction rating for Product Quality, After Sales Service in Users’ Satisfaction Survey, 2007. Award being presented by Mr. Sandesh Pradhan of Aplab Limited, to Mr. Soumendu Sinha of APC MGE INDIA. Video Clip | Zoom View Eaton PW9300 (three phase) modular UPS was adjudged the SD’s No. 1 in SD’s Users’ Satisfaction rating for product quality of Online UPSs above 60 kVA. The company was adjudged Best in providing After Sales Service and in providing End-User Education for its entire range of products. 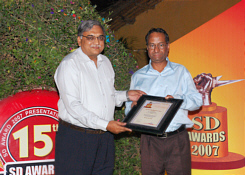 Award being presented by Mr. R Chellappan, CMD Numeric, to Mr. Robin of Eaton Power Quality. Video Clip | Zoom View Microtek has been adjudged best in After Sales Service for Online UPSs below 60 kVA and also the best in case services for Line interactive UPS Systems in this years survey. Award being presented by Mr. R k Bansal, MD Uniline to the Microtek team. HiTA TECHNOLOGIES PVT. LTD., KOLKATTA. Video Clip | Zoom View AHA Series from Hita was adjudged the SD’s No. 1 in SD Users’ Satisfaction Survey Rating for product quality of online UPS upto 20 kVA Single Phase in SD Users’ Satisfaction Survey, 2007. Award being presented by Mr. 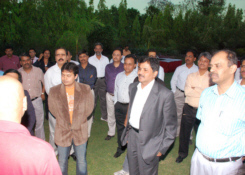 I B Rao, MD Power-One, to Mr. Arun Ghosh of HiTA Technologies. NEXUS POWER SYSTEMS, NEW DELHI. Video Clip | Zoom View Nexus was adjudged the Best in providing After Sales Service for its entire range of products in SD Users’ Satisfaction Survey, 2007. Award being presented by Mr. Ramesh S, MD Powertronix to Mr. Ramesh Khosla of Nexus. Video Clip | Zoom View POWERNET registered “A++” Satisfaction Ratings in Single Phase Online UPS Systems between 20 to 60 kVA range in SD USERS’ Satisfaction Survey, 2007. Video Clip | Zoom View ASIA POWERCOM’s Vangaurd brand earned “A++” rating with 91% satisfaction level while its offline UPS emerged as a leading brand 92% satisfaction level in SD Users’ Satidfaction Survey, 2007. Award being presented by Mr. Narayan Sabhahit, MD Techser to Mr. Tejas Sheth of Asia Powercom. Video Clip | Zoom View Powertronix Systems registered “A++” Satisfaction Ratings in SD’s USERS’ Satisfaction Survey, 2007. Award being presented by Mr. Soumendu Sinha of APC MGE & Mr. Rajan Chadha of Tritronics to Mr. Ramesh S of Powertronix. Mr. Sanjay Agarwal as an individual worked tirelessly to augment the cause of Indian UPS manufacturers in Supreme Court and various Govt. Forums, in those days UPS manufacturing was not more then a cottage industry. Even today Mr. Agarwal refuses to trade and is into manufacturing of PCBs (rather programmable PCB). We have seen almost every town in the country having atleast some 7 to 10 so called manufacturers who are able to sell through relations. And his concept of START through his programmable PCBs is really admirable. He continues to be the mouthpiece of UPS Manufacturers through AUM. As such, Softdisk has honored him with its Life Time Achievement Award.
. . . Promising to meet again on 2nd Sunday of April, 2009.